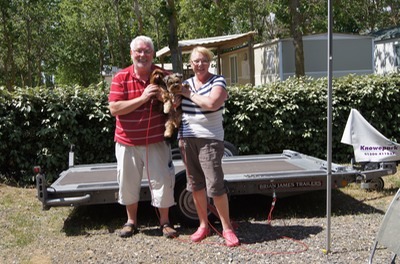 Motorhome Travels 2014 ~ places or entries underlined provide a hyperlink; click to open and view. 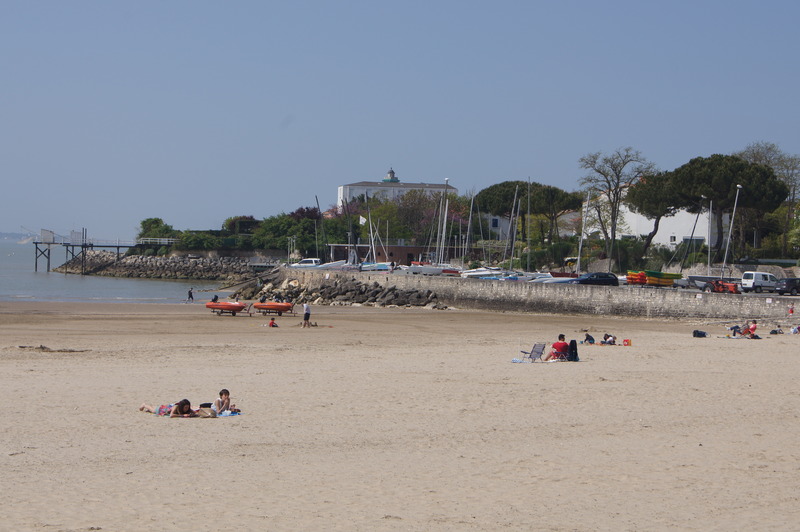 Half-way between Great Britain and Spain in the middle of the Romanesque Saintonge area Campsite Bois Soleil will captivate you with its wooded parks and its direct access to a 4km long sandy beach. We spent an idyllic week there. We moved further south today to St Georges-de-Didonnes, on the Atlantic coast; the camping site, Bois Soleil, is excellent and we have a large pitch with electricity and water. The beach is amazing! We have just had a lovely dinner in the restaurant a few metres from the site, which finished with a crêpe Grand Marnier - very nice! As usual, the drive down was not without its difficulties. First, and almost as soon as we started, the GPS/SatNav decided to take us on a short cut down some narrow rural roads - not that we realised until it was too late!!! It also wanted us to turn right at a non-existent junction!!!! Our 2 hour 40 minute journey became 3 hours! Anyway, we arrived without further incident... except for our dear Maya! In France it is the law that, during travel, pets should be secured in a harness. 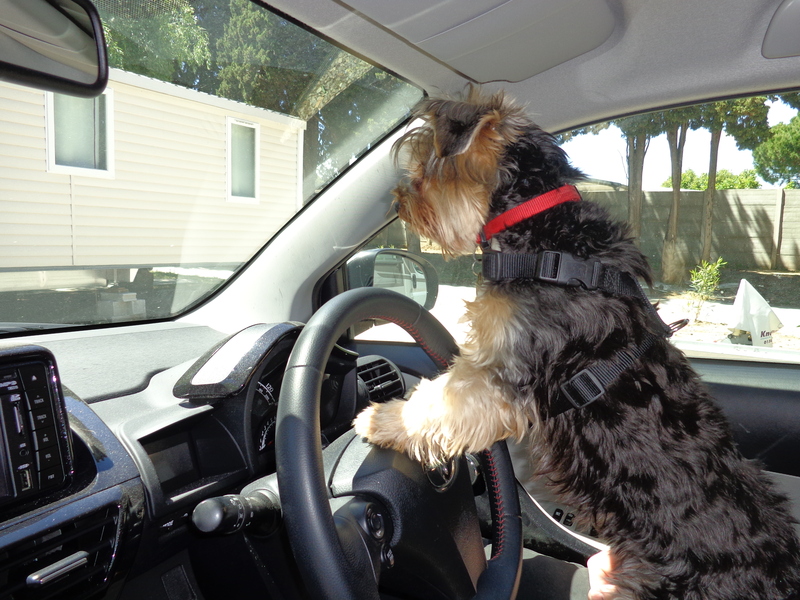 Maya was, but managed to escape and jumped up on to Margaret's lap… just as we reached a roundabout where TWO gendarmes on motorbikes were stationed! She suffered an ignominious drop to the floor - just in time! It has got warmer than the past two days, and we enjoyed some late afternoon sun sipping some more Rose d'Anjou. Bliss! 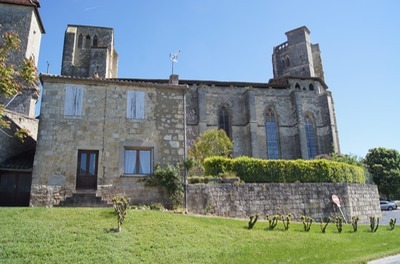 We have English neighbours, John and Carol, who are staying here for a month, then moving to the Dordogne for another month. They have done this for some years now! Maybe we'll do something similar in future years. Maya sure picks her moments! Once settled on the site we put them out on their stake. A little later we were in Bixie when we heard them barking and by the time we got to the door, they had managed to pull the stake out of the ground, were on the path running circles around this shrieking French Madame and her pooch, with the long leads and stake following them barking as they went. It took a few minutes to collect them, their leads and stake and try to pacify this upset lady. What pests they can be. Priceless is one word for Magan & Maya (M and M) but I can think of others, which maybe should not be put in the written form. Today, thankfully, has passed thus far without too much incident. We walked to the beautiful beach yesterday afternoon to find that dogs are not allowed on it, which was a bit of a downer. However, we did have a nice walk along the dunes, although we didn't want to let them off their leads and Maya was so in need of running off some energy. We spotted a lovely cove with steps down to its beach which did not have a published dog ban, however, there was quite a lot of people on it. We decided it was best to take them first thing in the morning when it should be quiet. Managed to lose her Kong frisbee along the way (^_^). 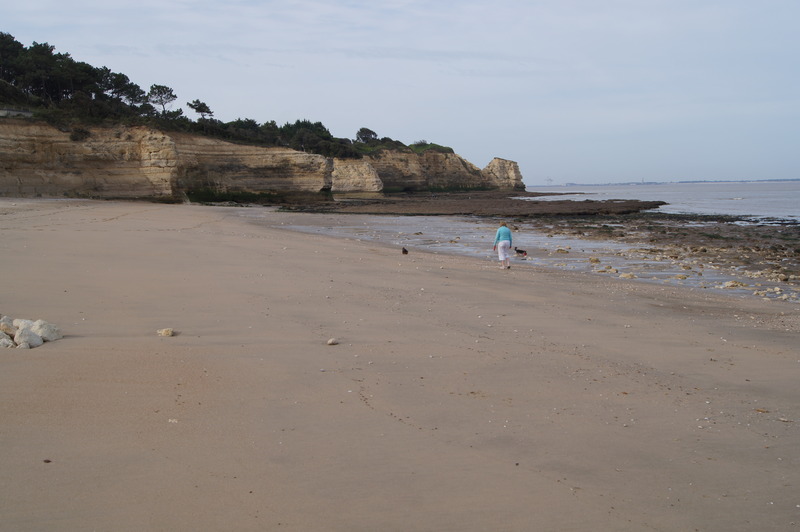 Got our wake up woof (call) at 7:15am today and she duly got her run on the beach; lots of rocks for Maya to explore too. 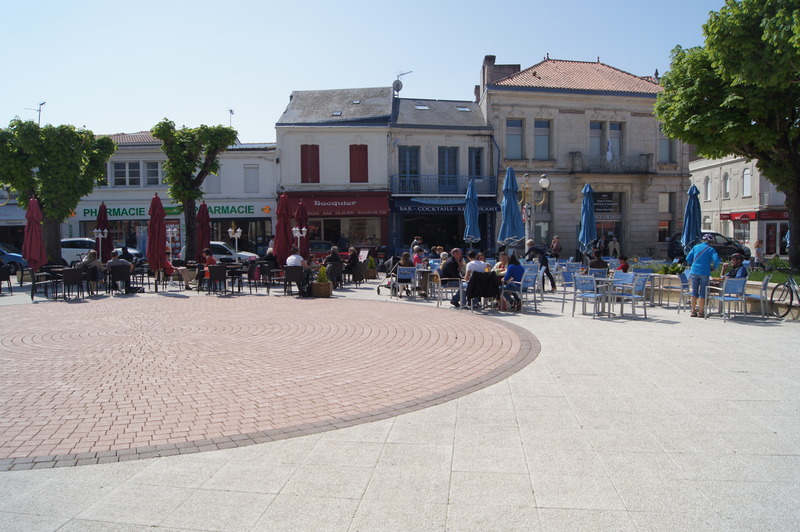 After re-stocking the cupboards - yes, another supermarket visit, we went into the town of St-Georges-de-Didonne. It was lovely, dominated, as they seem to be, by the church. I was standing just a tad close when the bells rung 3pm. I have an appointment to get a pedicure tomorrow at 12 noon, so pretty feet tomorrow. HL is lounging outside sipping wine and soaking up the late afternoon sun. By sounds emanating from outside, M and M would like their dinner, so I'd best comply with their wishes. No real plans made for tomorrow, we did notice that the beach in St George allowed dogs, so we'll see. We had a great day yesterday in St-Georges-de-Didonnes; Margaret had a pedicure and reappeared with toenails painted in a colour called cognac - very appropriate for us and actually very pleasing to the eye. While this was going on I had a very pleasant rest and cappuccino in an open-air restaurant in a beautiful square in the town; then wandered around taking some very nice photos. The beaches around here are amazing! This is a place we could happily come to stay for a month at a time. I'm still working on how to get all our photos uploaded so you can see them without killing my monthly data allowance! We also went to a place called Talmont; a closed community in a beautiful village - it has 83 residents and 500,000 visitors a year, now including us. Again we have pictures. ving it to me as a souvenir. What a lovely gesture. Tomorrow is forecast to be warm but cloudy, so not sure what to do. I would love to visit Lourdes but it is a 2-hour drive each way and we will have a fairly long journey on Wednesday. The nearest big town is called Condom - yes - that's what its called, don't know how to pronounce it though. The fact that none of our gas burners is working is a problem and we are hoping that there may be a caravan shop there who might be able to help, although cooking in this heat is not a priority at the moment. Sunday 5th; we moved to Le Camp de Florence in La Romieu, listed as a UNESCO World Heritage site. We are in the Midi-Pyrénées region. 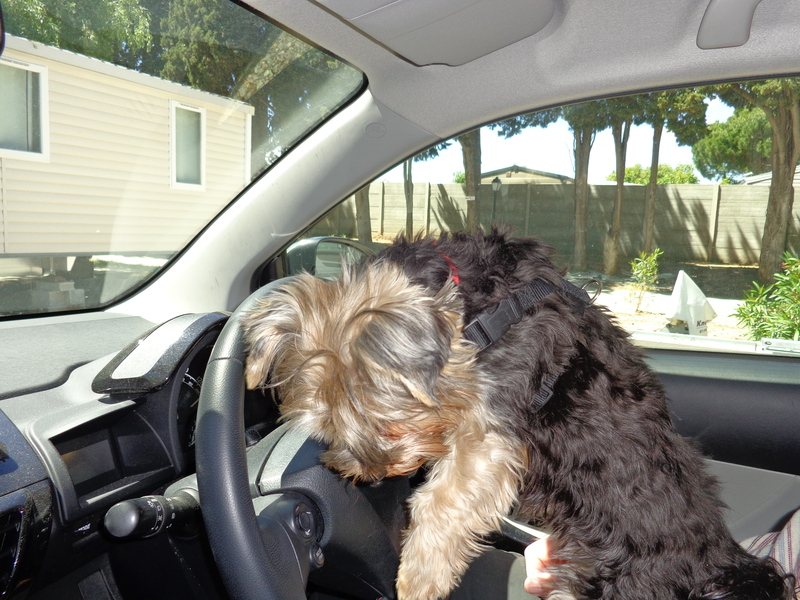 It was a very long drive in fantastic but hot weather. Our campsite is amazing; a complete contrast to any of the other four French sites we've been on so far. We are truly in the middle of nowhere, quite high up I'd guess! But the weather this evening is great. Another bottle of rose has been well received. The challenge today seems to be associated with our gas hob; none of the rings will stay alight!!! Margaret has made history by hard boiling eggs for the salad in the halogen oven! Day 26 - Here we are in La Romieu, in a region that, we are told, is historically the oldest part of Europe. 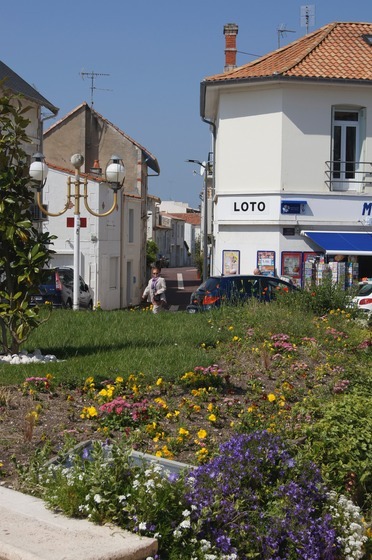 We went into the village of La Romieu this morning; when we arrived yesterday it seemed as if the whole place was under construction of some type or another. Seems as if the roads of the village are all being resurfaced at the same time and a lot of renovation work is being carried out, obviously before the high season starts. As a result we were not able to see properly this beautiful village and the photos we have will include items of construction at worst or hoses at best! I visited the Epicerie and it took ages just to get milk and cheese. There were a few people before me, all of whom have to be greeted, thanked and au revoir'd before the next person is seen to. A good old-fashioned store and a nice experience. The rest of the day we sat in the shade and enjoyed the beautiful sunshine, 24˚ today. This is the most tranquil site with the loudest sounds being the birds chirping and the church bell tolling the hour (twice) in the background. Tonight we will go to the site restaurant, it has a good reputation and its signature sweet is prune ice cream with Armagnac - guess I will just have to try that one (^_^). We were very tired yesterday after Wednesday's long drive, tried to find the beach access but had to give up - very muddy route to say the least - so M and M got no beach despite our promises yesterday, although now know that the doggy shower works (^_^). Found a Hyper U, which was open despite it being a French holiday. Massive, massive supermarket, biggest I've ever been in. We found a solution to our hob problem and now have a wee electric grill which boiled us perfect potatoes and a hard-boiled egg for our salad last night. Had to buy HL a Speedo type cozzie as they don't allow guys to wear swim shorts in the pool, why not goodness only knows. It is a lovely pool though - not been in it yet. Yesterday's temp was 28˚ at its highest, but the wind got up during the night and we had to consider taking the awning in but it was still standing this morning, all good. Today it has been very bright and sunny but with 21mph winds. We went into the town of Valras Plage, what a traffic mess that place is. Someone had parked at the exit to the car park that made it very difficult for ingress and egress let me tell you. We found a parking space, which was little short of a miracle, and the Le Poste, where we were able to ask for an envelope with a stamp for - had to say Angleterre - and the lovely lady understood. What a comparison to yesterday's checkout operator at Hyper U - a dour faced individual if ever I saw one. Clutching said envelope, returned to car park, what a struggle to get out (^_^). Made our way towards the beach, the first area we turned up to had a sign forbidding dogs on the beach; decided to move further along and found a wee empty space for Maya to expend her energy on for about 30 minutes before another dog turned up. Deciding that we had probably got more time alone than we expected, we returned to the site. Lounging around reading after lunch, we noticed a couple donned in swimsuits heading in what we thought was the general direction for beach access. They looked as if they knew what they were doing so I decided to follow them. Turned out they didn't, although they did find a path through the scrub beside the soggy path to a point further along than I had yesterday, but still haven't seen the beach from the site! I'm not going to try again, it's much easier to get into the car and drive a wee bit than to get scratched to bits and risk an ungainly a... over elbow on a muddy path (^_^). M and M have been well behaved today; they were a bit noisy yesterday and needed a stern word or two. I would like to have dallied a while longer in the town of Valras Plage, we have only one full day left here and I don't yet know what tomorrow's priorities are, but it is very different from the other seaside towns we have visited and I am so glad we are here just now as in high season it must be heaving and it was difficult enough getting around when it was just busy. M and M have been very well behaved today, which is good given the general tranquility here (^_^). Port de Vendres : Nice Marina but the wind was too great to be able to enjoy a walk with the dogs. Béziers : One of the oldest cities in France dating from 575BC. It hosts the famous FERIA de Béziers Bull Fights every August. We are not talking bull here! Our drive through the city was just that! The place was so busy, we passed a very large street market and it looked like all the locals were out in force from far and wide. We could not find anywhere to park! Our tour around the city included an attempt at dodgems by a couple of French drivers but we came out unscathed but frustrated. We crossed a stone bridge - Le pont vieux - very narrow, less than a single lane! It most certainly looked old; we wondered if we were allowed to drive over it (we saw no signs, but you never know what we might have missed); however a Van Blanc was following behind so that reassured us. White Van provides Reassurance - now that would be a headline in the UK! We visited the Domaine de Sainte Germaine in Vendres. We enjoyed a tasting of their Merlot, Cabernet Sauvignon, and two other wines from neighbouring Domaine de Sainte Vistoule. A lovely lady in the Caveau had some English, she was much better than we at French, who explained the wines and told us we could only buy their wines there; it is not sold in other countries. Sounds like we'll be returning soon! The wines were all very nice and we made some purchases; as if we wouldn’t!!! We move on tomorrow to Port Grimaud for a 7 night stay! The journey from Vendres Plage to Port Grimaud was estimated to be 338 kms, 3½ hours, swinging round Montpelier and back towards the Mediterranean. Traffic wasn't too bad but the SatNav sent us up the mountain on the D558 over to Grimaud then down to Port Grimaud! Scary stuff at times but we got there! It took about 6 hours routed as we were. The better route would have been to continue on the motorway to Sainte Maxime, then come back on the coast road to Port Grimaud. We know now! 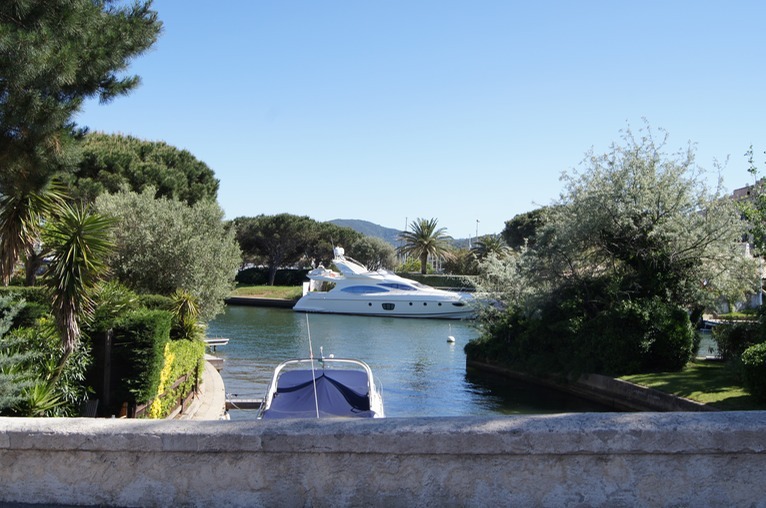 We were staying at Holiday Marina, Port Grimaud which we had been looking forward to for some time. This was one of the few sites that we had booked in advance, having heard from a friend of ours, in Livingston, who has an apartment there. Also, we had visited the marina some years before when staying with dear friends who have a holiday home in Sainte Maxime. It is a magical place where the community residents have their apartments with berth(s) included. The Holiday Marina campsite is across a busy main road from the Port and it can be difficult exiting and crossing the road because of traffic. We were staying there in May but we remember from our previous visit in August just how dangerous this can be for people on foot or bicycles. However, the campsite was well laid out, for the most part occupied by static caravans for rent or purchase, and a poolside restaurant. 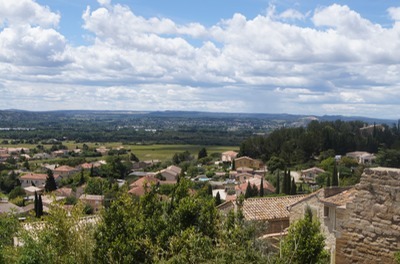 The touring pitches were at the far end of the site with a spectacular view of Grimaud and the mountain of Maures. On the downside, another very busy, and noisy, road ran along this boundary, screened only by a hedge. The upside is the private facilities provided on every pitch; they are spacious & luxurious, consisting of a modern shower cabinet, toilet, washbasin, heated towel rail, ample storage shelves and the possibility of a fridge if required. The pitch also provided individual dishwashing facilities. We had dinner in the campsite restaurant, staffed for the most part by English people. From the menu, we had the best Roast Beef and Yorkshire Pudding we have ever had in a restaurant, anywhere. This is a traditional English Sunday dinner or lunch but it added to a very different French experience for us. Very tasty but not French! The area is amazing! Plenty of beaches, lots of opulence to observe, sun sea and french wine. A fabulous place. We moved yesterday from Port Grimaud to Saint-Aygulf, close to Frejus and St-Rapheäl, staying at the Sandaya Résidence du Campeur. This is a great site and they allowed us to check in just after 12 noon - 4 hours earlier than their posted check in time! Our pitch is big, very nice, although the private facilities leave something to be desired when compared with those at the Port Grimaud site. However, I think we will enjoy this site very much. Today has been hot! Guess what? It was a supermarche day!!! The site has a Spar supermarket but did not have all we needed; it did have today's London Times though. So the great search for LeClerc in St Rapheäl began - you will not believe the places the french find to locate their stores; nowhere obvious, of course. It took 20 kms to get there and 7.8 to get back! On the way there we saw some fabulous coastal scenery, which we will return to with M&M when in tourist mode. Our daughter, Honor's, recipe for Spaghetti Carbonara was very much enjoyed again in spite of the break in electricity caused by having too many devices on at once. This site offers 10amps where the previous one was 16amps. We now know where to reset the CB if it happens again! Another beautiful day here in St Aygulf. We weren't allowed the luxury of a lie-in like yesterday, when we didn't get our early morning woof (from Maya) until 8:20 - it was the usual 7:30 today. Found a beach on which dogs are welcome not so far away. Maya is full of pent up energy after the really bad weather at the weekend, our move on Sunday and quietish day yesterday so she can be forgiven (maybe) for throwing herself at the first dog she noticed. We had just let her off her lead and she was happily playing with the Frisbee when we noticed a dog nearby; unfortunately, so did she. So she spent most of the time on the lead, which does not help her unspent energy. Our plan for tomorrow is an early visit to this beach in the hope we will get in before it gets busy. After lunch we played Boules, lots of fun - HL won of course 12-7, I think, but I lost count. We really will have to find out more about the rules of the game, how to differentiate on whose boule is whose and other little matters about the game. It was fun though. We have an excellent Spar supermarket just next door, a huge attraction for us. The staff are very friendly and it is a very well stocked shop; we may not need to travel far and wide in search of provisions while we are here. We extended our stay here today until Tuesday, 28 May. The area is lovely and the site is great. 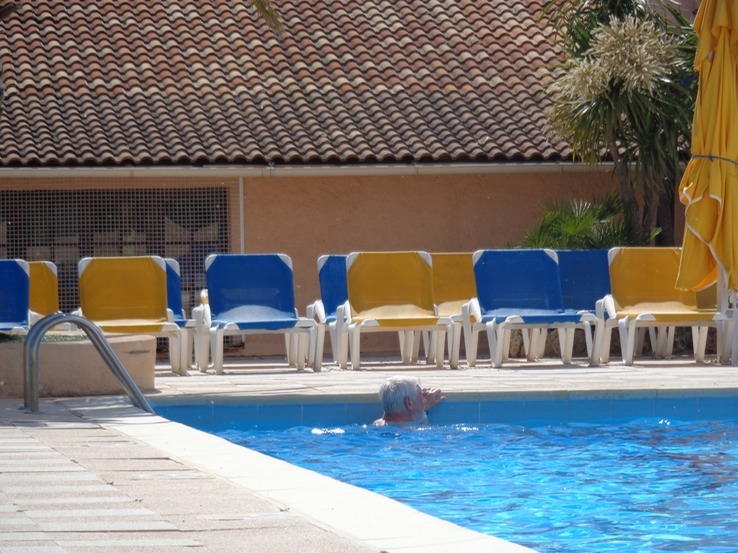 HL is planning of going down the flumes into the main swimmingpool, I will be there with the camera if he does. We have a lovely pitch, it is paved with shrubbery around, so I think it is the first time Bixie has been on the level since we set off, feels strange not to be at a slant of some degree. We have our own private facilities; not a patch on Holiday Marina in Port Grimaud, the only good thing about that site was that they had the sense to build theirs three steps up, including the disabled ones, incidentally, we couldn't figure out how that was going to work. However, they were so pristine. Here we have ants and snails for company but, you know, I'm getting used to it! I was bitten on my hand by some French insect yesterday; what an effect, it was like having a hand-lift, my hand looked 20 years younger for a day, down to 10 now though and guess back to normal tomorrow! Wish I could find that beastie again (^_^). It is such a beautiful evening here, still and very warm. Need to go and make dinner; salad will suffice this evening for sure. 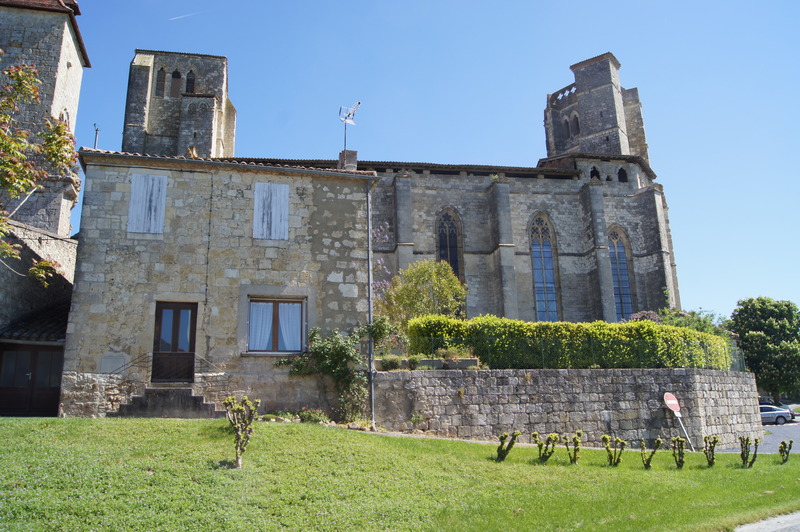 Staying in Campéole L'ile des Papes for four nights from 28th May. Looking forward to exploring Avignon. What a difference a day makes! Yesterday was a fantastic day weather-wise; today, we are in Villeneuve-lès-Avignon - it is chucking it down and the temperature has dropped to 14˚! Back to Monday, a day of trauma! The dogs took us to the beach in Saint Aygulf. We parked the car; with few spaces free we had to park on the road-side rather than the beach-side of the car park. This very busy main road is separated from the car park by a concrete divider, about a metre high. Margaret got out, but before the door could be fully closed Maya jumped out, jumped over the divider into the middle of the road (looking for mum) then jumped back over the concrete wall into the car park!!!!! It is only by pure chance that there had been a gap in the traffic at that precise moment!! However many lives a dog has, Maya has one less now! I think perhaps we will have one less year of ours too. Trauma over, they did have an energetic time on the beach, thank goodness. Our new campsite on an island on the Rhône at Villeneuve-lès-Avignon has brought us back down to earth with a thud. We've been spoilt over the past two and a half weeks with 'private facilities' but here we're back to sanitaire blocks; no toilet seats nor toilet paper!! Fortunately, we have our own ... paper, not seats. We are staying here for only 4 days though. This all adds to the rich tapestry of motor homing; we just love it! 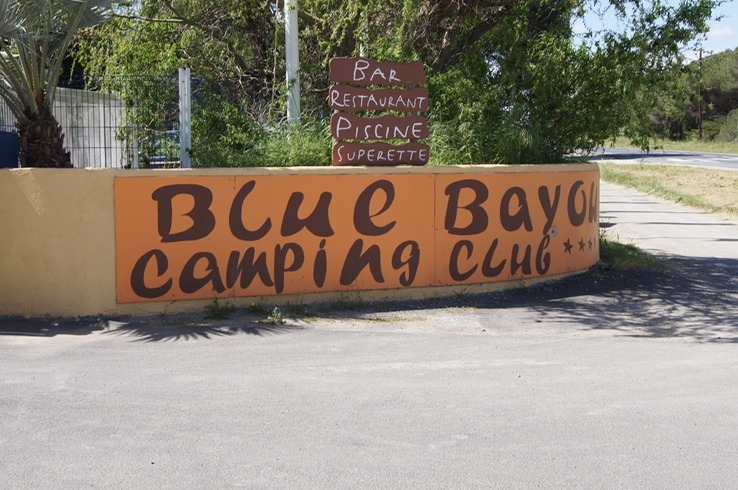 This campsite is on an island on the Rhône; we are looking forward to exploring the area in the next couple of days. Day 48, 29 May, (Margaret) dawned a much better one, still short on warmth and a little breezy but, thankfully, dry. We went into Avignon and my first priority, even before Le Pont, was to get something done about my hair. The sun in the South had bleached it so much and it had grown so long. I chose a hairdresser simply by looking through the window and seeing full chairs - the first one I had passed in all the places we have visited. Made an appointment for 2:30pm which gave us time to wander around (trying not to get lost) and have a bite to eat. 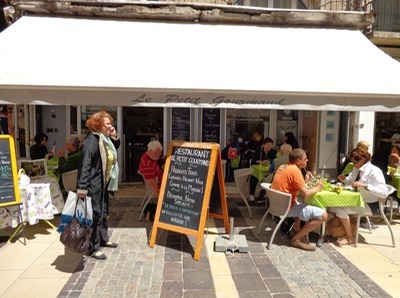 We sat down at a pretty little restaurant with outside tables and chairs, Le Petit Gourmand. According to its board it rated 5 in Trip Advisor and 93% of its patrons recommended it. It was simply lovely, a husband and wife team runs it, he cooks, she does everything else. 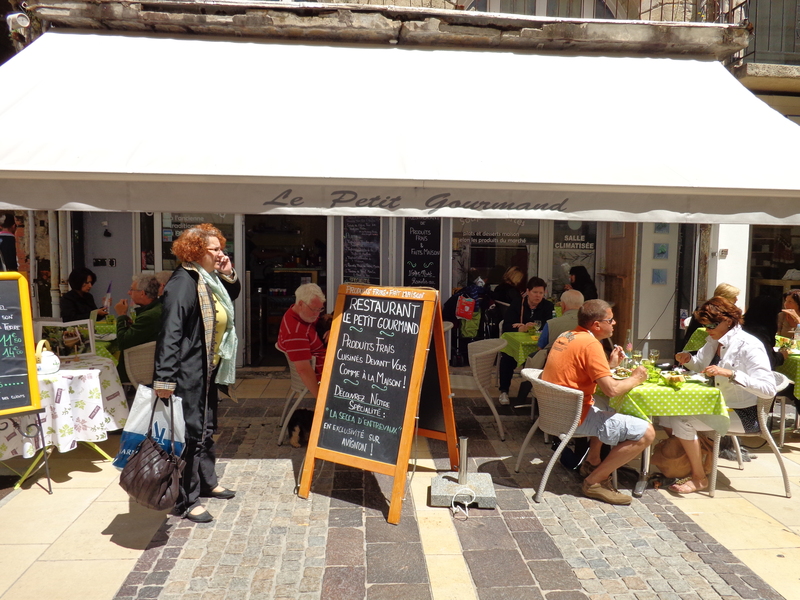 So, so pleasant, she took time to go through the French menu with us to ensure we understood what we were ordering. Our meals were delicious, HL had Ravioli stuffed with Frois Gras in a mushroom sauce and I had Tagliatelle with smoked salmon, crême fraiche, herbs and garlic. Yummy. I would have loved a repeat visit but that was not to be this time around. After lunch, wandering down towards the hairdressers, we met this lovely couple and their Yorkshire Terrier, Maya being her usual aggressive self at first sight (^_^). However, we had a really interesting chat with them and they wrote down for us all the interesting places we should see while we were there. Really nice people. Loved my hairdo and am so grateful to HL for putting up with two Yorkshire Terriers while I got my roots sorted out. He went to the Pont and the Palais des Papes, and enjoyed a special cuppa in a Salone de The, and a seat in the square people watching. We met up again two hours later and went back to the site to discover our Internet was down. A phone call advised that it would be "back within an hour". Didn't actually get it back until 9am the following morning. 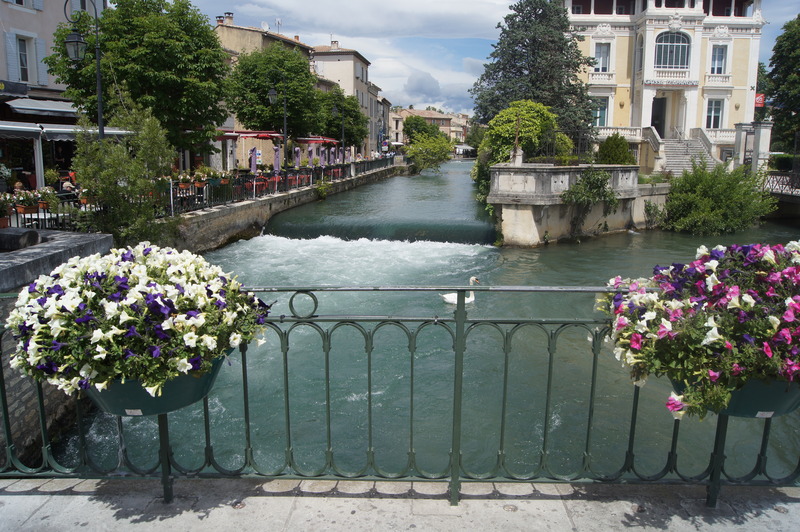 Day 49 - 30 May - We set off to find L'Isle Sur La Sorgue only to end up in Sorgue, I would compare this town to, say, Wishaw (^_^), certainly the least pretty of all towns we have visited. However, it was on the road to Châteauneuf des Papes - what an experience that was. Not only the wonderful scenery, looking down onto the Rhône from such a height it resembled a silver snake in the beautiful green countryside. e grapes and the liquid would pour into the smaller one, both preserved for all that time. Of course, after the tour, there was the tasting. WOW!. 8 wines in all, 4 reds, 3 whites and a Muscat, which was beautiful. Naturally, we had to buy a bottle or two! The sun was out at last when we got back so we sat out for a wee while. Our pitch was on a corner and everyone stopped to chat which made for late dinner. 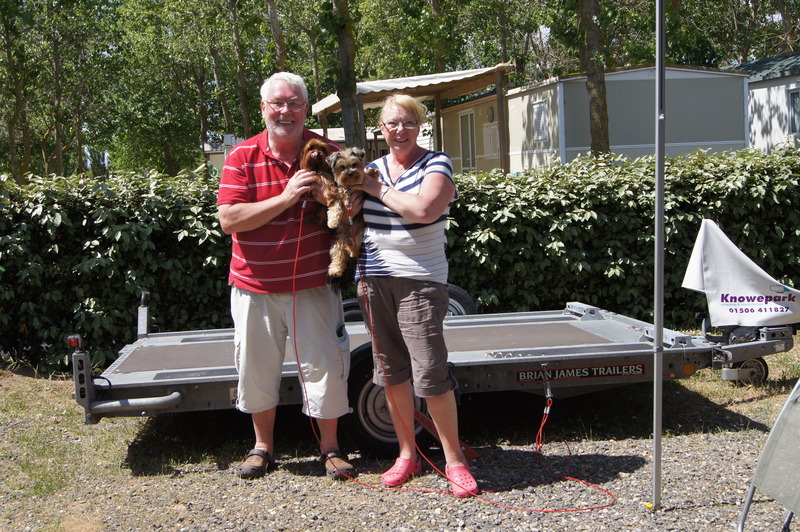 Then a German couple who had arrived at the site at the same time as us came by. They had been to La Source and were keen to share their experiences. Day 50 - 31 May - Thanks to the German folks input, we found L'Isle sur La Sorgue, what a lovely town with a canal running down the centre, nice shops and street cafes; just what you would want to see in France. 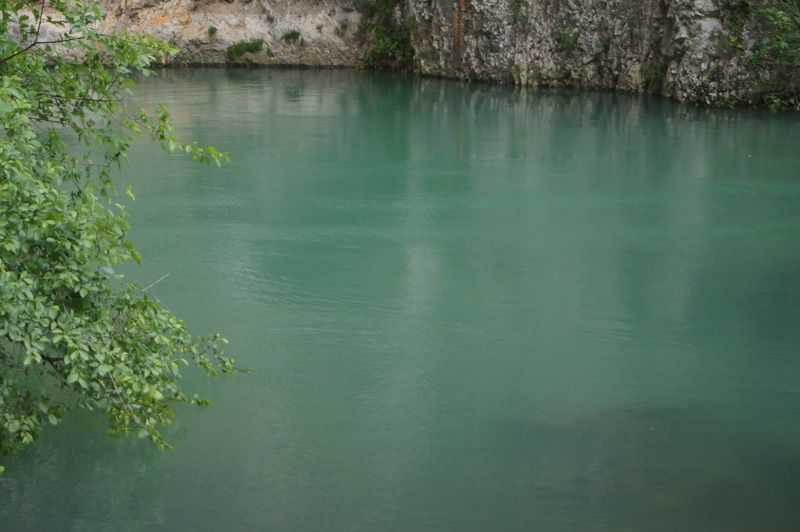 We then went on to Fontaine du Vaucluse, to see the spectacular source of the River Sorgue - there is no visible source, just high cliffs with still water, which is amazingly green. It was quite a walk though, and Missy Maya was at her worst. The weather wasn't so good either, very strong winds, but it was worth it to see such a spectacular sight; took lots of photos. Late home, just about in time to make our agreed date to speak to Laura on Skype -:))) and that was another day done. 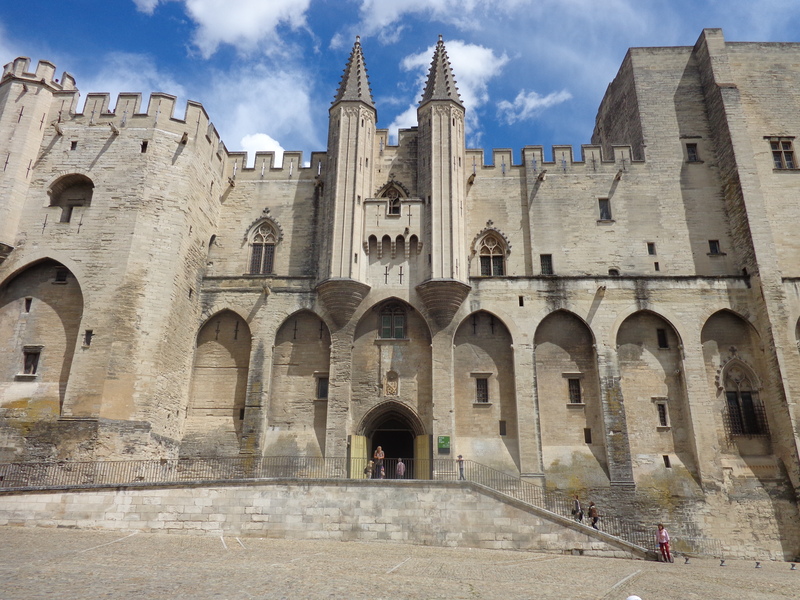 After greeting us with torrential rain, Avignon said goodbye to us with 42mph winds. Glad we weren't staying there any longer, although it is the most beautiful place and well worthy of a visit! I'll leave HL to catch you up on today, suffice to say we have moved to the most beautiful site ever. We changed our course when we saw the weather was not going to be so good, so we are back in the mid Pyrénnées. The site is the Kawan Village Les Peupliers Riviere sur Tarn and it is a wee piece of heaven on earth. It is so pretty and the site is beautiful, in a small village with, apparently, a restaurant that is very good right next door. We are right on the banks of the River Tarn, which is so clear - no shopping trolleys dumped in there! We crossed the Viaduc de Millau to get here, what an experience that was. A magnificent structure - think it cost 10 Euros 50 to cross it, but whatever, it was worth it. The weather is set fair for the next week - it's great to be able to follow the sun! The adventure continues on the next webpage.